What happened at the Pacific Regional? 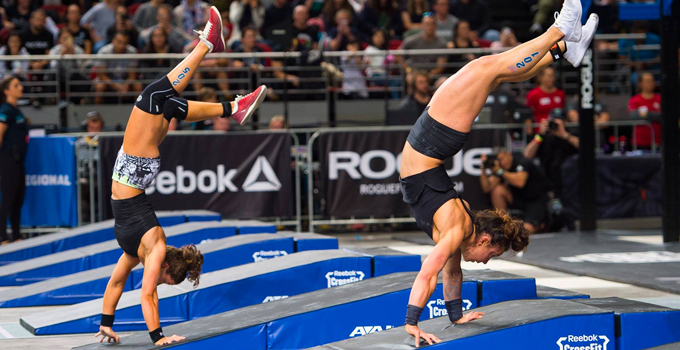 Reigning Fittest on Earth 2017 champion Tia-Clair Toomey edged out Kara Saunders for the first time at Regionals by just 30 points. Tia-Clair Toomey had an outstanding performance over the weekend and took first place in Event 1, 2 & 6 and second place in Event 3, 4 & 5. She also broke Event 6 record on the final day. Kara Saunders was hot on Tia-Clair’s heels all weekend, taking first place in Event 4 & 5 and second place in Event 2 & 6. Kara also broke an Event 5 record on the final day. For the second straight year James Newbury runs away with the top spot on the leaderboard, dominating from the opening event at the Pacific Regional. He took first place in Event 1, 2 & 4, and second place in Event 5. He wins first place overall by 100 points. Courtney Haley was the only female rookie to qualify, taking first place in Event 3 and forth place overall. Dean Linder-Leighton performed well all weekend, and was the other rookie to quality, taking 1st place in Event 3 and second place on the podium. Justine Beath took 2017 off from competition, which obviously did wonders for her physically and mentally and paid off, with her walking away with the 3rd qualifying spot to the 2018 CrossFit Games. Royce Dunne held on all weekend and took first place in Event 6 which secured his forth place finish overall. Maddie Sturt qualified for her third consecutive year to the CrossFit Games, taking the final qualifying spot. The most compelling and incredible comebacks from down under was Zeke Grove. Heading into the final event Zeke pulled through and found a way to get it done. He had a 50 point deficit heading into Day 3. This was the largest comeback ever where he overcame 40 points in the final workout. That is the largest ever in history, and he is the first athlete at Regionals to jump from outside of the top 10 into a qualifying spot on the final event. His second place win in Event 6 secured him the final qualifying spot, and he’s headed back to the CrossFit Games. Team Reebok CrossFit Frankston was lead by Rob Forte, and they won by 40 points over Schwartzs CrossFit Melbourne.